Now, Edge’s finding has been supported, extended and brought to worldwide attention by the independent work of Dr. Michael Rappenglück. Misinformed journalists and academics are crediting Rappenglück alone with the discovery of the earliest star maps , but Rappenglück cites Edge’s findings in his work. Graham Hancock, Heaven’s Mirror, 1998, pp.28-29. Frank Edge, Aurochs in the Sky, 1995. A map of the Pleiades, a group of seven stars that form part of the constellation known today as Taurus, is located just over the shoulder of a bull drawn near the entrance to the cave. Spots on the bull itself may represent other stars found in this region of sky. A map of the “Summer Triangle” (stars Vega, Deneb and Altair) is located in part of the cave’s interior known as the “Shaft of the Dead Man”. The stars are represented by the eyes of three figures – a bull, a bird sitting on a vertical stick, and a strange bird-man. The Summer Triangle is so named because it is especially bright during the summer months. Significantly, 17,000 years ago this star group would have never been below the horizon. Rappenglück has also uncovered a map of the “Northern Crown” constellation located in a cave in the Pico del Castillo mountains of Spain. This map is thought to be 14,000 years old. The most obvious implication is that, as was argued in Heaven’s Mirror, the traditional view of the zodiac being a Graeco-Babylonian invention is wrong. The association of the Pleiades (part of Taurus) with a bull shows that information, and especially that which is of great importance or transmitted in certain formats (like art and folklore), can be passed down through great stretches of time. Together with engraved moon maps (such as that from 3,000BC in Knowth, Ireland ) and the careful astronomical alignments of prehistoric megaliths (such as the Maltese temples ), these Ice Age star maps demonstrate that the heavenly bodies and their positions were of central importance to our distant ancestors. Graham Hancock and others are seeking to understand why. 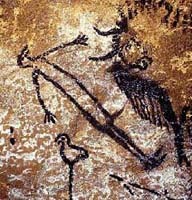 “A ritual body posture identified among the cave drawings was depicted as a stick figure lying in front of a giant auroch. Various archaeologists speculated that either he had been killed by the aurochs or the drawing related to some kind of hunting magic. “From the perspective of ecstatic trance, neither of these explanations is correct. First, the man is not dead… Second, the man’s head is a bird mask, and beside him stands a staff with a bird at its head. These suggest that the man is a shaman, journeying as a bird into the Sky World, perhaps with the assistance of a bird who is his spirit helper. The similarity of the two figures is, in my view intriguing, especially when we consider the sky religion of the ancient Egyptians and their desire to be transformed into stars after death. Perhaps Lascaux shows us not only that the constellations were recognised 16,500 years ago but also that sophisticated spiritual ideas have much more ancient origins than has previously been believed. Another point to note on this matter is raised by my friend John Anthony West in his wonderful book Serpent in the Sky. He shows that complex mathematical proportions are encoded within the posture of the Egyptian figure and that it yields the “Pythagorean” 3:4:5 triangle thousands of years before Pythagoras. Perhaps the roots of such mathematics are even more ancient than the Egyptians? Dr. Rappenglück publishes his work on the web, at http://www.infis.org/ (though some of it is currently only in German).